After P. Diddy finished the New York City Marathon in 2003, he credited iontophoresis, or the use of a small electrical current to transmit an anti-inflammatory medicine, with curbing his knee pain enough to let him complete the race. I was unaware of P. Diddy’s experience before my doctor suggested ionto, as it’s commonly called, for my IT band two years ago, the first time I received this nifty, noninvasive treatment. I’m receiving it again now for peroneal tendonitis and/or an inflamed posterior tibialis (or, to keep it simple, a cranky ankle), and I’m optimistic it’ll get me over the why-does-it-still-hurt hump. Here’s how the treatment works: A physical therapist fastens a patch with anti-inflammatory ointment to the spot on my ankle that hurts. 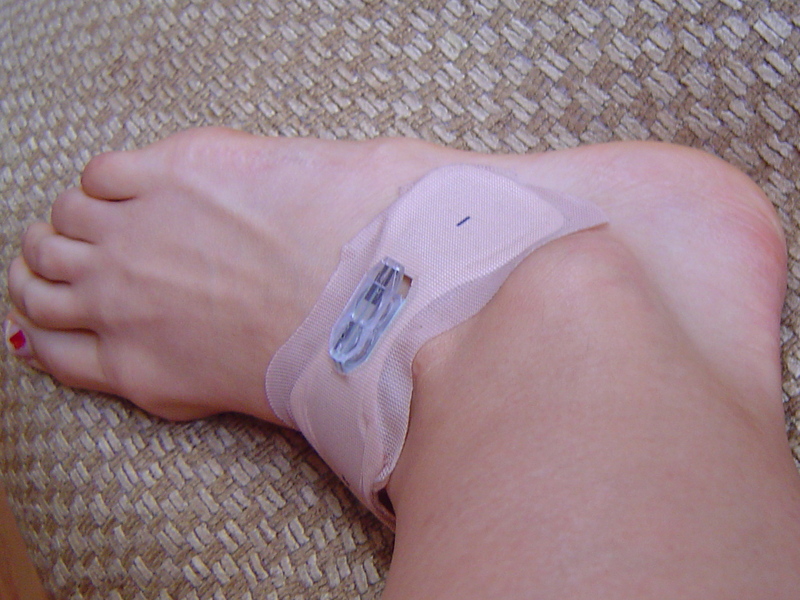 Then, she attaches a tiny device that administers a low electrical charge for just a few minutes – since I use the self-contained patch, there’s no need to keep it hooked up to the device for long (another version of ionto uses a large machine to transmit the charge, and takes about 15 minutes). I feel a slight twinge — not pain, exactly, but a little sensation that lets me know something’s going on. I leave the patch on for two hours to let the medicine do its thing. Repeat, essentially, every other day for two weeks. I like that this is noninvasive and basically risk-free. I like that I’m receiving the treatment on my ankle — since the muscles and tendons are closer to the surface there, my chances of it working are greater. I like that I may have the boniest ankles in the history of ankles for the same reason. Finally, I like that it’s only one way I’m looking to attack the problem. I’m also doing several prehab exercises given to me by the therapist I worked with yesterday, an enthusiastic woman named Toni. Toni told me she embarked on a prehab program to strengthen her own ankles after multiple ankle sprains clued her in to possible weakness. She gave me a TheraBand, and showed me how to use by pointing and flexing my foot in all four directions: plantar flexion, like pressing on the gas pedal in your car; dorsiflexion, pulling back in the opposite direction; and inversion and eversion, or pulling the resistance band from side-to-side.With the ionto and the exercises, it can only be a matter of time before my ankles are in good working order again! Thanks to everyone who commented on my post about managing a runner’s stomach. My next experiment, thanks to your thoughtful and interesting suggestions (other ideas still welcome! ), will be oatmeal and a banana. Which sounds pretty delicious, even without the run. Cool! Gotta love technology like this. Wishing you an extra-speedy recovery so someday soon you can join us on trail! My PT used ionto on my injured hip last spring. It certainly helped in the healing process. I loved that I could wear the patch home and it kept doing it’s thing without me needing to stay in the office. Hope it continues to work well for you!